Contemporary sofas have a lot to offer from unsurpassable comfort to style and sustainability. Contemporary sofa features trendy yet elegant designs which provide maximum comfort. Ranging from neutral to vibrant colors, and a variety of fabrics including linen, polyester, ultra-soft microfiber and bonded leather, the contemporary sofa allows you to choose the best one. The graceful Huntsville Sofa will add comfortable style to your living room. This elegant sofa is crafted from manufactured wood in the USA so you can rest assured of its make and quality. Thanks to its curved spring system and thick foam padding, your family and guests will sit comfortably on this sofa. 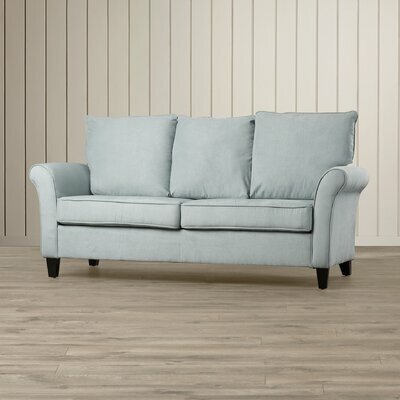 Its flared arms, brown block legs and 100% polyester upholstery in warm Cobblestone (light grey) color add a fashionable touch to its overall look. Assembled in the United States with global components. Fabric finish: Cobblestone (light grey color). Available in more fabric colors including Mocha, Café, Sage and Salsa Stone. Upholstery material is 100% polyester. Low melt fiber wrapped over high quality foam. Sinuous spring system for maximum comfort and durability. Stress welting for crisp and lasting shape. 8 inches thick seat cushions are very cozy. Stylish flared arms are thickly padded and features stress welting. Legs are made from hard plastic. Block style legs in medium brown finish. 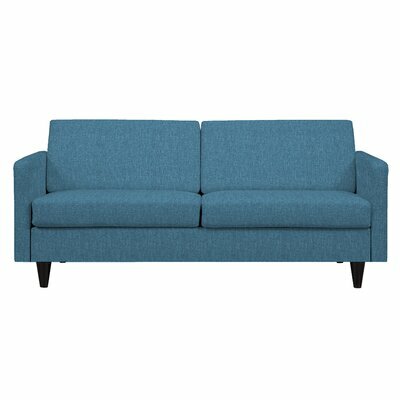 Sofa requires minimal assembly and is very easy to assemble. One year limited product warranty provided by manufacturer. Product Care: Spot clean with water based cleaners only. The elegant Franklin Sofa will transform your living room space into an inviting haven. Reinforced hardwood construction renders long lasting strength and sturdiness to the frame. High-density foam cushions are made from eco-friendly polyurethane foam. Renewable natural resources are used to make this eco-friendly foam. 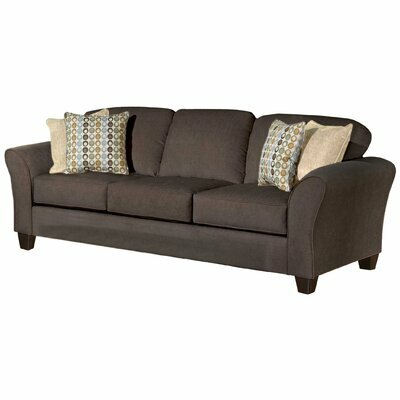 With its flared arms, dark brown tapered feet and crisp welt tailoring details, this versatile sofa symbolizes style and comfort. The Franklin Sofa is available in multiple classic hues to complement an array of room decors. It has seating capacity for three. Also available in lovely Viewpoint Coffee fabric finish. Upholstered in durable polyester-cotton woven fabric. High density foam cushions are eco-friendly. Velcro on the bottom of the seat cushions. Flared arms with crisp welting. Wooden feet with tapered style in dark brown color. Create a comfortable and stylish space in your living room to snuggle in with your book with the lovely Serta Upholstery Winchendon Sofa. It is upholstered in San Marino Chocolate finished faux leather upholstery that looks chic and stylish. Large squared arms, thick seat and back cushions give you an immensely relaxing seating space. The elegant sofa is a must have and will be a smart addition to your living room. Built in-house frame from hardwood (70%) and OSB (20%) or plywood. All corners and stress points of the frame are reinforced by blocks, glue and staples. Hardwood lumber is used in all load-bearing areas and stress points of the frame. Faux leather upholstery in San Marino Chocolate finish. Dark brown finished feet support the sofa. The luxurious Augustine Tufted Sofa merges elegance and style to create a tastefully designed masterpiece. 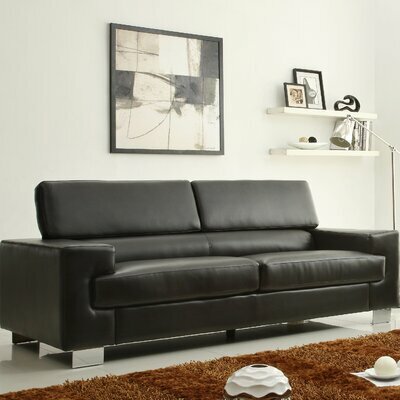 It features a modern seating style with the neatly tailored silhouette, rolled arms and stylish dark brown legs. 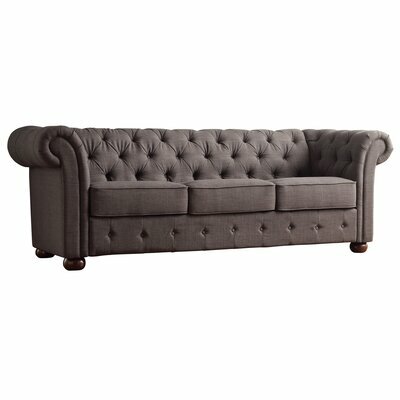 The gorgeous dark gray colored upholstery is beautifully tufted with button tufts at the front base, arms and back cushion of the sofa. This true classy centerpiece is perfect furniture to glamorize your living room décor. Sofa easily accommodates three people. Frame is constructed from Rubberwood. Available in more beautiful fabric colors including Grey, Purple, Red and Brown. Brown colored sofa features faux leather upholstery. 6.7 inches thick cushions are immensely comfortable to sit on. Button tufts accent the front base, arms and back. Maximum weight limit is 650 lbs. Tools required for assembly are included with the sofa. Kingstown Home provides one year limited product warranty. The contemporary Shelton Sofa is a stylish display of class and comfort. 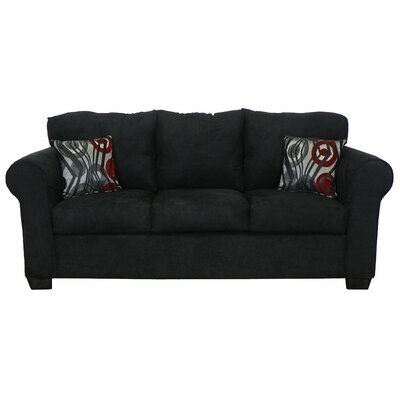 With its bulldozer black finished upholstery, comfortable seat and back cushions and elegant rounded arms, this beautiful sofa is a perfect addition for the living room. Frame is made from hardwood and legs are molded from plastic. Available in more fabric colors. Includes two throw pillows with beautiful pattern. Back cushions are attached but can be removed when required. Cushion covers can be removed for washing. 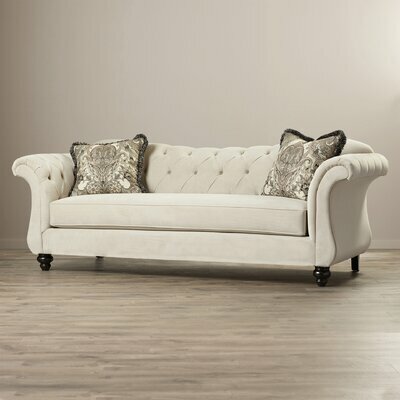 Create an eclectic focal point in your living room with the gorgeous Mercury Row Caldera Sofa. Its fresh neutral barley tan colored upholstery blends seamlessly with a wide array of room decors. Square arms and cone-shaped legs in dark espresso finish complement its overall look. It requires less than two minutes to assemble this smartly engineered sofa. Sofa can fit three people comfortably. Frame is made from long lasting and robust wood. Upholstered in 100% polyester fabric that looks and feels like linen and complements most decors. Fabric color of this sofa: Barley Tan. Available in many more gorgeous fabric colors such as Caribbean Blue, Chocolate Brown, Fuchsia Pink, Kiwi Green, Mustard Yellow, Midnight Black, Orange, Smoky Charcoal Gray and Turquoise Blue. Pocketed coils are topped with layers of foam and synthetic fiber to create a luxurious seating system. Back and seat cushions are removable but not reversible. Cone shaped legs in dark espresso finish. Just click and slide the individual pieces to assemble the sofa with the Handy Lock no tool feature. Innovative engineering with smart packaging technique allows you to assemble the sofa in that very room where you want to place it. Maximum weight limit is 900 lbs. Create a timeless picture-perfect living room with the classy Devon Premium Sofa. 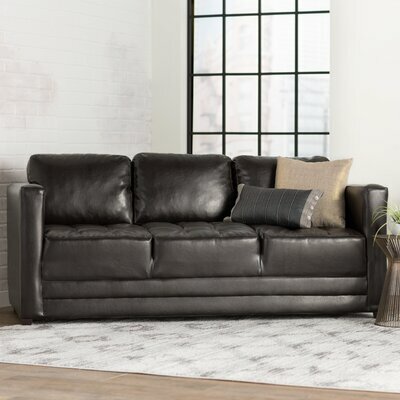 This artistically designed sofa features reverse camelback, premium fabric upholstery tufted with crystal-like button tufts, flared arms and stylish legs. Its gracefully curved silhouette and classy style are reminiscent of elegant formals and ballroom delights. Two fluffy matching toss pillows with beautiful intricate pattern and fringed edges add graceful waves to its entire appearance. With its awesome looks, the contemporary Devon Premium Sofa is a must-have for the sophisticated living room. Sofa frame is constructed from hardwood. Corners are blocked and guarded for structural integrity. Upholstered in Light Mocha colored 100% polyester fabric. Available in more fabric colors such as Cream White, Yellow, Purple and Grey. Includes two matching toss pillows in premium fabric cover with fringes. Long and extended seat is topped with comfortable and plush foam cushion. Back cushion are tufted with crystal-like acrylic button tufts. Stylish flared arms accented with button tufts. Simple, sleek and elegant, the Beachcrest Home Paget Sofa is an ideal choice for your living room. Its clean lines and significant cuts are quintessential of the transitional style making it perfectly apt for most of the room decors. It features a refreshing blue color that adds brightness to the room. Fluffy and comfortable seat and back cushions are very cozy. The sofa is balanced and supported by four dark espresso legs that create a beautiful contrast with its blue color. Pair this lovely sofa with complementing accent chairs to complete your set. This CARB compliant sofa maintains the indoor air quality of your home. Innovative engineering and stylish design. Upholstered in beautiful blue colored, stain-resistant microfiber upholstery. Two cushion seat with seating capacity for two people. Exceptional pocket coil seating system with 200 coils for ultimate comfort and durability. High resilient back foam cushions are 11 inches thick and comfortable. 8 inches thick seat cushions are immensely comfortable. Cushion covers are removable for washing purpose. Dark espresso finished wooden legs are in tapered style. ISTA 3A certified to remain safe during transit. Maximum weight limit is 600 lbs. Very simple and easy to assemble with the help of Allen wrench. Beachcrest Home provides one year limited product warranty. Product care: Spot clean with mild soap and cold water. Adorn your lovely home with the stylish and comfortable Carnmore Sofa. Quintessential of Mid-Century style, this chic and classy sofa will prove to a warm and inviting addition to your home décor. For unsurpassable strength and durability, it is manufactured from kiln-dried wood. It is a perfect combination of beauty and robust structure. High-density foam cushions make this sofa immensely comfortable to sit on. The couch features premium-quality upholstery in refreshing mustard yellow color, tufted back cushion, flared arms and slanting conically shaped legs in black. With its distressed finish and worn-out look, this sofa boasts an understated elegance. You can place it practically in any room of your home including living room, bedroom, guest room, patio or even porch. Can comfortably seat three to four people with ease. Handcrafted from kiln dried wood for perfection and optimum durability. Also available in lovely Beige Linen and Grey fabric colors. Filled with CA117 fire retardant foam. Back cushion is accented with button tufts. Slanted and black colored legs in conical shape. Maximum weight limit of this sofa is over 1600 lbs. Apt for both residential and commercial application. The lovely Vernon Sofa by Woodbridge Home Designs will add stylish flare to your living room. The bold shape and defined angles of this gorgeous sofa exemplify the contemporary style making it apt for modern home settings. The uniquely designed Vernon Sofa features black bonded leather upholstery with silver metal legs and beautiful square arms. It is a two-cushion seat sofa with headrests atop each cushion for maximum comfort. This elegant sofa will be an excellent choice for a relaxing living room space. Adjustable headrests for a relaxing seating experience. Chic and bold black colored faux leather upholstery. Also available in white faux leather upholstery. Seat is expanded and wide enough to comfortably fit three people. Maximum weight capacity of this sofa is 275 lbs. Woodbridge Home Designs provide 90 days product warranty.